Hangjik can accommodate up to 12 people. There are two suites in the Shtëpia (Old House). The Pleme (Barn) is a separate building in the corner of the walled garden. 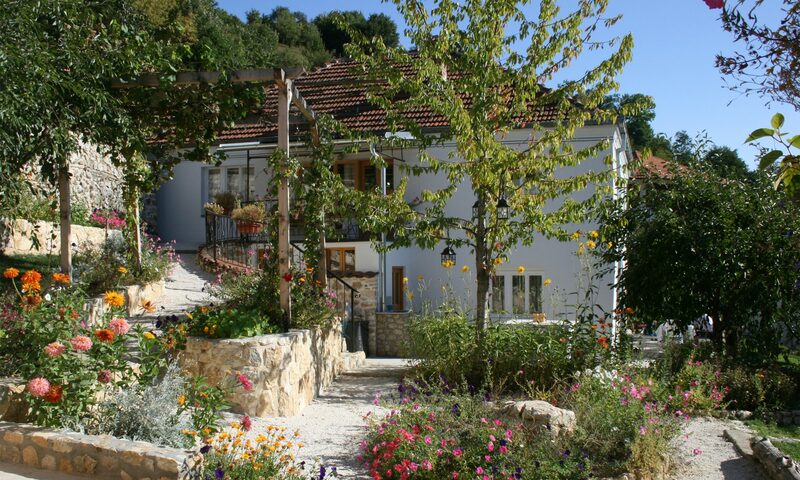 Both our buildings are based on a traditional Kosovo village home, being renovated to a high standard for a comfortable stay but also to preserve a sample of this type of housing. Each unit has a bedroom with bathroom plus a lounge, making luxury accommodation for single, twin or double occupation; with the flexibility for larger numbers, if required, through the use of sofa beds or traditional ‘shilte’ in the lounges. We are happy to use the accommodation flexibly and would love to hear from you to discuss any requirements you have, so please get in touch at info@hangjik.com. During your stay, you can choose to self-cater fully, have all meals prepared or a mixture of both. As long as we have 24 hours’ notice for any meals freshly prepared and provided by us, we are happy to be as flexible as you wish. We also do our best to cater for specific dietary requirements.